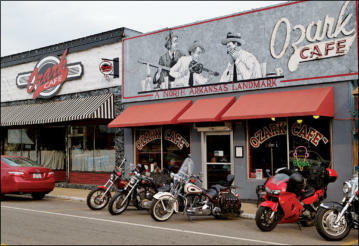 The center of activity at 8:00 a.m. on a Sunday morning in Jasper, Arkansas is the Ozark Cafe. Coffee cups rattle saucers in the cafe’s bacon-fried air while Billy Bell and his dad, Gene, hold court at a big checked-cloth-covered table. The family resemblance is clear between the two lean, sun-checked men gathered with a group of weather beaten locals swilling coffee and swapping the news of the day. the world, and their affection for the community is apparent when they talk about it. One of the men at the table, John Hudson, is a bit of a local legend. John built his home around the cabin in which his father-a well-known doctor in the middle of the century-was born, thus transforming the abode into a living museum filled with memorabilia from his dad's career. After breakfast, Billy and Gene take me on a quick walking tour of Jasper, which includes a visit to the smallest jail in the county. "The cells here are known as the worst in the state," Gene says proudly. "You don't want to end up in the slammer in my town." We go inside to check out the building, and Gene asks the deputy manning the front desk if he can show me one of the dank little cells. "No tours today. We had a helluva Saturday night," the deputy says dryly, "and the house is full." Serendipity granted me this ride with Billy and Gene. 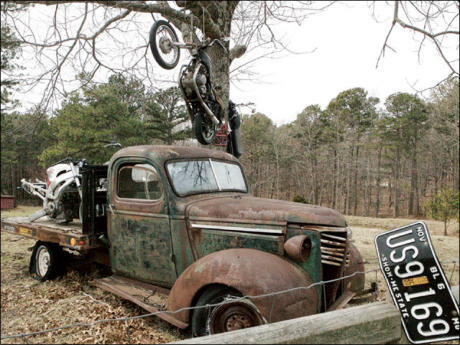 I was in the area with a couple of friends to join the Wudi Ride, an annual off-road motorcycle ride held in Arkansas each winter. Billy is not only an off-road rider, but a street rider, too, and when I said I was planning to ride the area on Sunday, he and Gene agreed to serve as guides and show me the sights. Jasper is on one of the great motor-cycle roads in the Ozarks, Highway 7, which runs from Harrison, just south of the Missouri border, to Hot Springs in central Arkansas and down past El Dorado on the state's southern border with Louisiana. 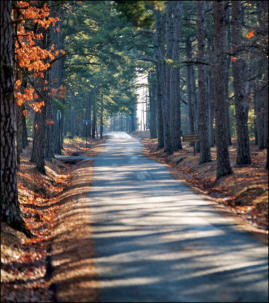 Highway 7 was Arkansas' first state-designated Scenic Byway, and the road curls through the Ouachita Mountains and north through the Ozark National Forest. We head east out of Jasper on Highway 74, riding over to Highway 123, a twisty stretch of pavement winding from Mount Judea to Lurton. Billy tells me that riders come from as far as Australia just to ride this technical stretch of road. On the other hand, a Gold Wing rider I met at Turner Bend told me to "avoid 123 at all costs." To each his own! We loop back north along Highway 7 and come to the Ozark "Grand Canyon," a deep, verdant valley much smaller than its Arizona counterpart but impressive nonetheless. Gene and Billy have to return to Jasper that afternoon, and I decide to join them and take up John Hudson's invitation to see his home and collection of artifacts. The place is outside of town, a beautiful farm set along an Arkansas bluff. John shows us how his immaculate, white, ranch-style house was fabricated around the one-room cabin built in 1826 that his father had grown up in. The original logs are preserved, as is the original porch, which is filled with old photographs of his father, along with collections of old medical equipment. John did most of the work on the house himself, from digging out the basement to laying down the floors. He also talks nonstop about his father's accomplishments, often with tears in his eyes. After our little tour, it is time for Gene and Billy to get home and for me to get back on the road. One of those roads, Highway 74, takes me west to Ponca. Billy had suggested I watch the fields for elk and-sure enough-I spot a few cows and a calf along the way. Newton County released 112 elk from Colorado and Nebraska in the early 1980s, and that program has paid off with a healthy local population. In fact, Newton County now calls itself the "elk capital of Arkansas," and the town of Jasper hosts the annual Buffalo River Elk Festival to celebrate the herd. 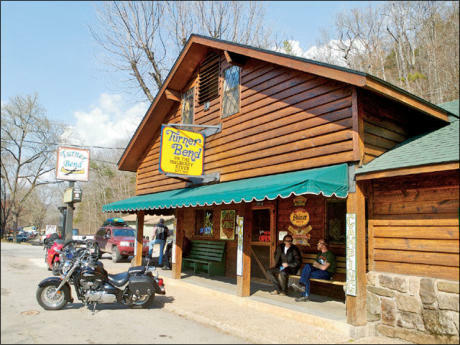 I head north on Highway 23 through Forum and Rock House and come out in the town of Eureka Springs. Legend has it that the springs had magical healing powers, and Indian tribes consider the area sacred ground. When Dr. Alvah Jackson "discovered" the springs in 1856, he reputedly cured his infant son of an eye ailment with water from the spring. The doc then founded Dr. Jackson's Cave Hospital. The final leg of the day's ride takes me west of Eureka Springs on Highway 62, which snakes into the low mountains of Boone County. 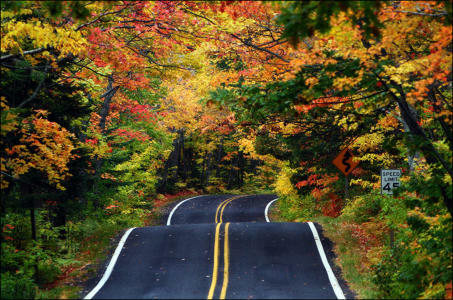 A scenic drive on 187, south and west along Beaver Lake, looks like another tempting option for someone with time and two wheels. My ride in the Ozarks ends a few hours later, as I turn north to head back to the frozen pavement of my native Minnesota. I'll soon be back home, telling stories to my friends and family about the trip. Travel tends to do that-offer up stories and my favorite trips are those that send you home with great tales to spin. 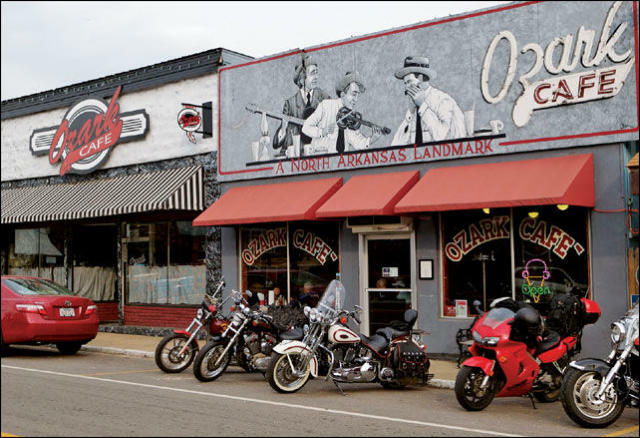 When I think back on this ride, my favorite memory is of the Ozark Cafe, a place where daily legends are as deeply ingrained in local culture as the stripes of Ozark Mountain pavement tumbling across the Ouachita Mountains. 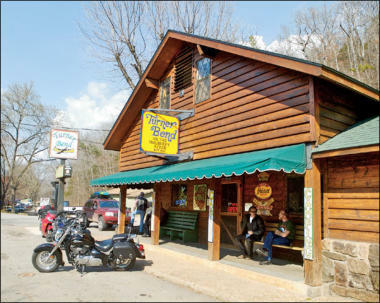 This has been going on at the Ozark since the place opened in 1909. The red walls of the cafe are adorned with black and white photographs that chronicle local history, the images giving life to the words of locals who have made permanent impressions on the cafe's red naugahyde and chrome chairs. The men at the table range in age from early 30s to retirement-ready, and they live in this corner of the Ozarks because they love it. Both Gene and Billy have made sacrifices to stay in this part of the world, and their affection for the community is apparent when they talk about it. One of the men at the table, John Hudson, is a bit of a local legend. John built his home around the cabin in which his father-a well-known doctor in the middle of the century-was born, thus transforming the abode into a living museum filled with memorabilia from his dad's career. After breakfast, Billy and Gene take me on a quick walking tour of Jasper, which includes a visit to the smallest jail in the county. "The cells here are known as the worst in the state," Gene says proudly. "You don't want to end up in the slammer in my town." We go inside to check out the building, and Gene asks the deputy manning the front desk if he can show me one of the dank little cells. "No tours today. We had a helluva Saturday night," the deputy says dryly, "and the house is full." Serendipity granted me this ride with Billy and Gene. I was in the area with a couple of friends to join the Wudi Ride, an annual off-road motorcycle ride held in Arkansas each winter. Billy is not only an off-road rider, but a street rider, too, and when I said I was planning to ride the area on Sunday, he and Gene agreed to serve as guides and show me the sights. 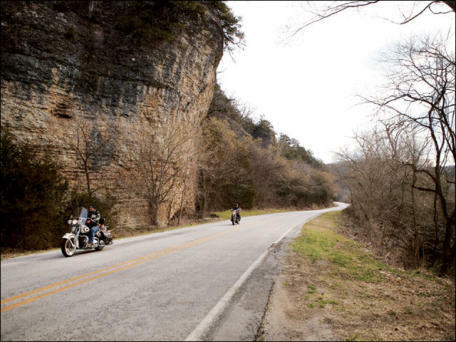 Jasper is on one of the great motor-cycle roads in the Ozarks, Highway 7, which runs from Harrison, just south of the Missouri border, to Hot Springs in central Arkansas and down past El Dorado on the state's southern border with Louisiana. Highway 7 was Arkansas' first state-designated Scenic Byway, and the road curls through the Ouachita Mountains and north through the Ozark National Forest. We head east out of Jasper on Highway 74, riding over to Highway 123, a twisty stretch of pavement winding from Mount Judea to Lurton. Billy tells me that riders come from as far as Australia just to ride this technical stretch of road. On the other hand, a Gold Wing rider I met at Turner Bend told me to "avoid 123 at all costs." To each his own! 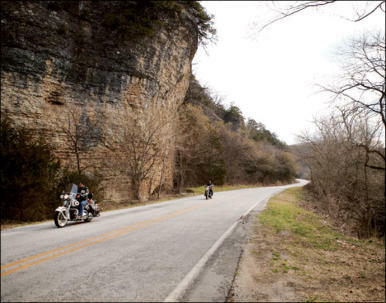 We loop back north along Highway 7 and come to the Ozark "Grand Canyon," a deep, verdant valley much smaller than its Arizona counterpart but impressive nonetheless. The final leg of the day's ride takes me west of Eureka Springs on Highway 62, which snakes into the low mountains of Boone County. 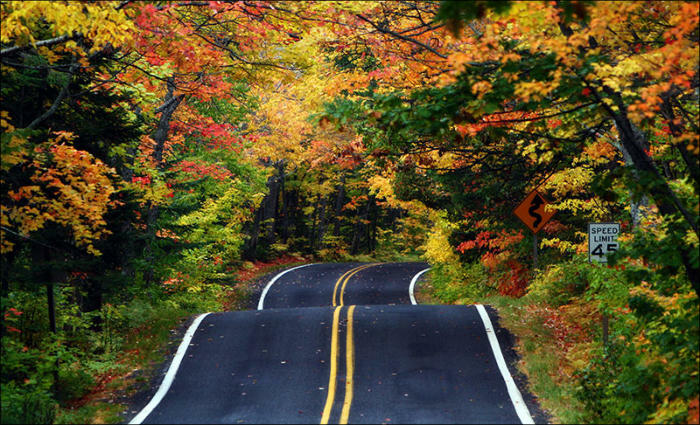 A scenic drive on 187, south and west along Beaver Lake, looks like another tempting option for someone with time and two wheels. My ride in the Ozarks ends a few hours later, as I turn north to head back to the frozen pavement of my native Minnesota. I'll soon be back home, telling stories to my friends and family about the trip. 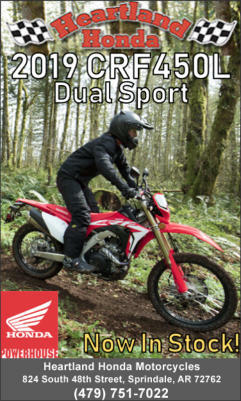 Travel tends to do that-offer up stories-and my favorite trips are those that send you home with great tales to spin. 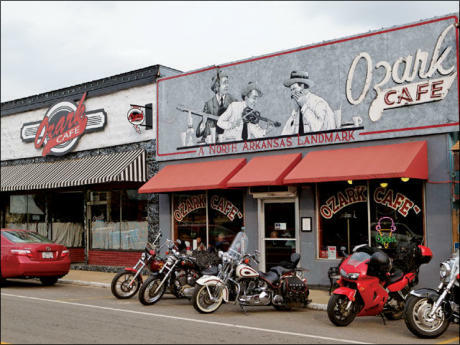 When I think back on this ride, my favorite memory is of the Ozark Cafe, a place where daily legends are as deeply ingrained in local culture as the stripes of Ozark Mountain pavement tumbling across the Ouachita Mountains.